Notes: There was a manga of the same name by Masami Yuki serialized concurrently in Weekly Shounen Sunday; this OVA series starts the timeline followed by the Patlabor movies, whereas the 1989 TV series occurs in an alternate continuity. In the (then) near-future of the turn of the 21st century, the world has developed giant robots known as "Labors" for heavy construction work. Criminals have begun using them to commit crimes; to combat this, as well as prevent Labor-related industrial accidents, police forces around the world have formed special divisions comprised of officers using Patrol Labors, "Patlabors" for short. This is the story of one such unit: the quirky misfit crew of Tokyo Metropolitan Police Special Vehicle Section 2, Division 2. Even back in the late 80s, early 90s, the mental image of "anime as a genre" was skewed towards flashiness and fan-service, though in those days "fan-service" was more oriented towards action sequences than titillation and the "moe" tropes we see now. Thankfully, there are exceptions to every rule, and Mobile Police Patlabor was one of them. Don't be fooled by the brilliant mechanical designs - this is not a mecha action series in the slightest, but a thoughtful, slow-paced, visually understated series that is interested in character work and rich storytelling, almost to the exclusion of anything else. In this case, that proves not to be a bad thing after all. It's important to understand who the creators are here to get an idea of what we're dealing with: the primary "ideas guy" is producer Mamoru Oshii, who by this point had already brought us the surreal Angel's Egg, and afterwards would come up with the Ghost in the Shell franchise. His penchant for profound, philosophical storywriting is put under the spotlight here, as the characters here are very vocal about the world they're living in and the events they go through - he also builds an optimistic view of a world which, which still obviously flawed, has overcome much of its socioeconomic problems with technical knowhow, which is fairly impressive given that this was made during the depths of Japanese recession after the burst of its economic bubble. Visually, this is quite good for the late 80s; the character designs by veteran (and personal favorite) Akemi Takada (Kimagure Orange Road among many, many others) have an understated appeal, while the mecha designs by Yutaka Izubuchi (later known for RahXephon) feel utilitarian to the point of hyper-realism and even , as if this is the closest thing we're going to get to applying Gundams in real life, and it's really a treat to see Labors in civilian applications, as opposed to seeing them strictly in military applications. Of course, you can't have a character piece without good characters and Patlabor offers these in spades. The headliner here is Miina Tominaga (DNA^2's Karin Aoi) as cheerful redhead Noa Izumi, who is the right degree of genki without ever crossing the line to annoying Pollyanna. My favorite character, though, is feisty, hyper-competitive Japanese-American NYPD transplant Kanuka Clancy, voiced by veteran seiyuu Yo Inoue (Gundam's Sayla Mass) who sadly passed in 2003. There's even a touching and subtlely handled thread involving the Division 2's laid-back, middle-aged boss, Captain Kiichi Goto (Ryusuke Obayashi - Soun Tendo in Ranma 1/2), and his quiet personal and professional relationship with Division 1's conventional-minded Captain Shinobu Nagumo (Yoshiko Sakakibara - Sylia Stingray in Bubblegum Crisis): a respectful, playful rivalry with a strong subcurrent of mutual attraction. All of these are standouts among standouts - each of the members of SV2 is well-developed and hard to put easily into a set stereotype, which lends even more realism to a setting that's already more "realistic" than a fair number of so-called "slice-of-life" series out there. If there's any faults here, it's that Patlabor seems to go out of its way to portray things as plainly and seemingly mundanely as possible, so when you run into, say, a Godzilla pastiche in the third episode, it's played almost completely straight. And yet there are some moments of really great drama, particularly late in the series, that simultaneously anticipate the upcoming movies, but also turn out to be some of the finest material ever to grace a straight-to-video production. In its day, the cerebral realism of Patlabor was a game-changer for the mecha genre (and for its own creators) and it's easy to see why. In some ways, the often light-hearted humor here in the OVAs is an even better balance to the action than the sometimes too-stoic, downright severe nature of the movies, where the SV2 team's quirkiness can be easily missed. When you finally get to the action, it's every bit as skilled as the rest of the production given the age of the production and limitations of the medium at the time - there is just not a sour note to be found here. What's really impressive is that this was actually originally intended as kind of a parody of the concept of "giant robots in the real world", but instead of merely poking fun at the mundanity of using labors as patrol vehicles and construction tools, we instead get a rich, vibrant world setting that is very easy to mistake for our own world. 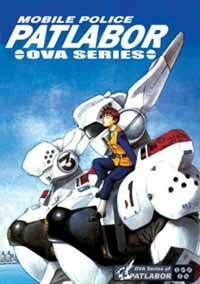 In far too many series, the mecha themselves are the raison-d'etre, the central focus; Patlabor goes the other direction and uses them as a rich hue in the palette of a skilled storytelling team, and while this is clearly a dry-run for the movie and television series that the creators clearly desired to make, it should be said that this work is very truly exemplary and groundbreaking on its own, and deserves our highest commendation. Recommended Audience: There is some violence involving the Labors, but no sexual themes or fan service whatsoever. Should be fine for teens and above, who would be better equipped to understand the plot and themes within this series anyway.